So recently, sometimes my knocker goes off for a free game but then seems to stay energized, makes a terrible electrical chattering noise and gets really hot. When I turn the game off and on again it starts right back up making the same noise. It stops once I push the start button. Then it plays a few games fine with the knocker firing as it should but then randomly starts doing the same thing again after the knocker fires a few times. Where do I start with troubleshooting this? Here’s a link to the noise it’s making. The schematic (isn't on ipdb) but will show you what activates the knocker/sounder solenoid which needs to be inspected, should be an EOS switch on the credit/replay unit. I looked at all of the available schematics for this era Bally. All of them use one of the two basic circuits below-- these were snipped from Bon Voyage (left) and Boomerang (right) - each came out a few months after your game. The schematics in the months preceding were identical, but the quality of the images were worse-- point being, these two were only selected because of the image quality. Edit: I figured something out... the circuit on the left was used on all of the 1 player games. The circuit on the right was used on all of the 4 player games. Your machine will almost certainly use the circuit on the right-- so look at the credit unit end of stroke switch- it probably needs an adjustment. Everyone is leading you in the correct direction. Here is a photo (thanks xsvtoys) showing the credit unit and the switch stack of interest. 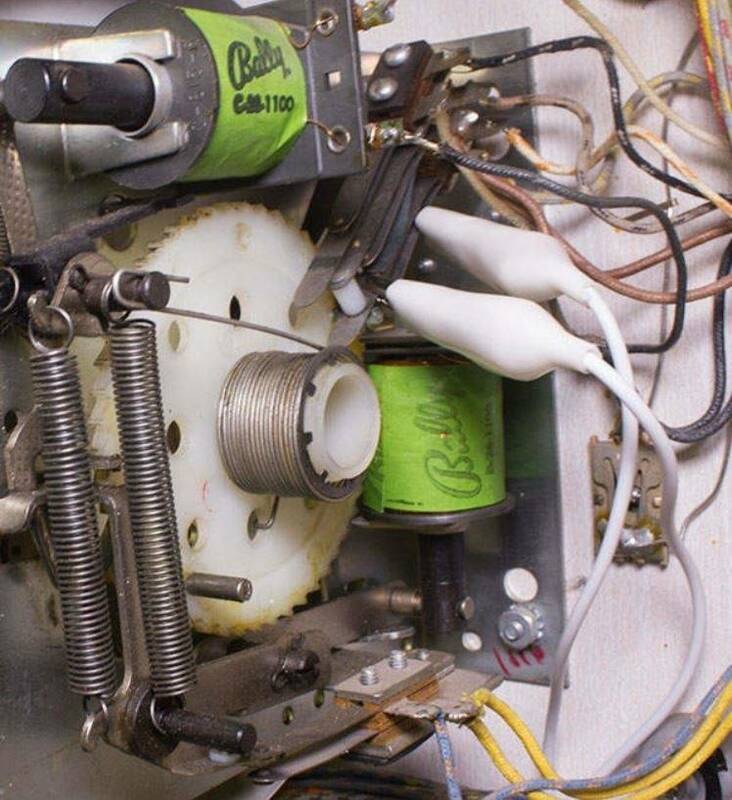 For the Bon Voyage and similar age machines, the credit unit end of stroke switch stack for the knocker is at the bottom of the photo. The feed voltage is the yellow wire and the switch makes contact with the Blue-Orange wire. Check this switch. Your colors may vary. If cleaning or slight adjustment doesn't fix it, start looking for other issues. 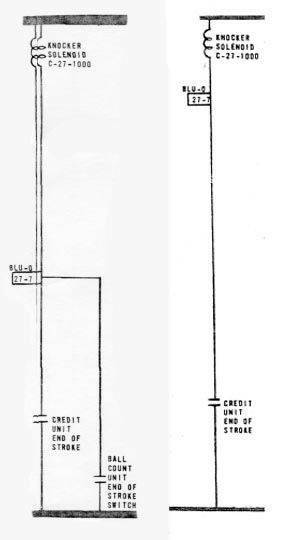 This is a simple circuit. Thanks to everyone for the input! I'll be looking into it tomorrow and report back. So after finally finding some time to dig into this problem I've found that the credit reel is starting to bind when it reaches 18 credits. It binds at red circle and doesn't allow the knocker leaf switch (green circle) to separate all the way which causes the knocker to be constantly energized. It does this every time the credit wheel tries to click over to 19. 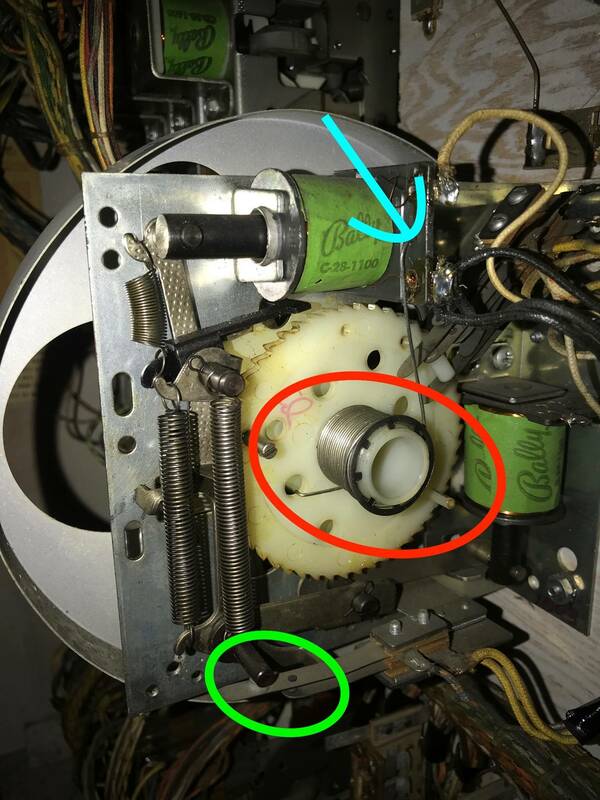 If I try to manually advance the credit reel the metal wire (blue arrow) gets pulled out of its hole. For the time being I have turned off extra credits for high scores and it hasn't happened since. It might be time for a cleaning-credit wheel assembly. Or can you see something binding it up as it reaches the 18 to 19 transition? I do not have an Bally pin. I look at the picture in Your post-6. On a Williams Replay-counter I would say "maladjusted". See my Williams Shangri La Replay Counter )JPG) - it has about five Credits on the Counter. Stepping up is turning clockwise. When stepping down 5, 4, 3, 2, 1 and now down to Zero: The rod marked "red" opens a switch - I cannot use the Credit-Button anymore to start a new game - the switch is in the wiring and the switch is open. 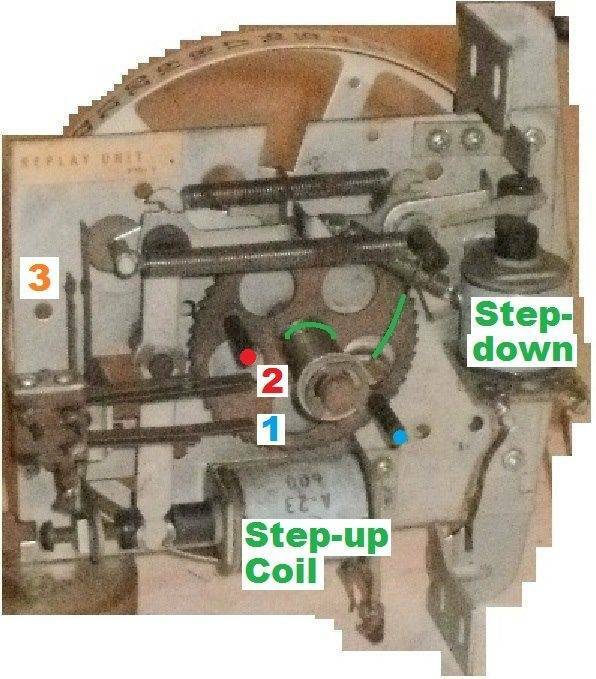 Coining up steps clockwise - the "marked blue" rod comes closer and closer and closer and then opens the MAX-Switch - this switch opened hinders current to flow to the Step-UP Coil (The Maximum is electrically controlled - it is not mechanically controlled). Not visible in my JPG (because I put the blue dot on the end of the rod in the picture) - the rod has a slot for an screwdriver to take the rod out --- several drilled holes to set MAX to maybe 10 or 15 or 20 or 25 or 37. In Your picture in the red circle I see the rod and its slot. - Take it out and set to maybe 10 or 15 MAX. The return spring long end is in the wrong place: your photo, blue arrow = wrong place. Skidave's photo = right place. Looks like it may be shorting one of the switches. pring just enough to function when clean, more is NOT better. Don_C nailed it. Although I haven’t disassembled and cleaned it yet, just unwrapping the return spring 3/4 and hooking it in the correct position fixed the problem. It now goes up to 25 credits without any binding. Thanks everyone for the help! Thanks for closing the loop, it's always good when we can see a final resolution.